It’s been a long time coming. It has been 25 years since the launch of the last Toyota Supra, way back in 1993. The internet was barely out of diapers back then, and all you really needed in life was a manual gearbox, a turbocharged 2JZ engine, a gigantic hoop spoiler on the trunk and your favorite tuner on speed dial. The A80 Supra was a milestone car—fun, fast, not terrifyingly expensive, and almost endlessly tune-able. 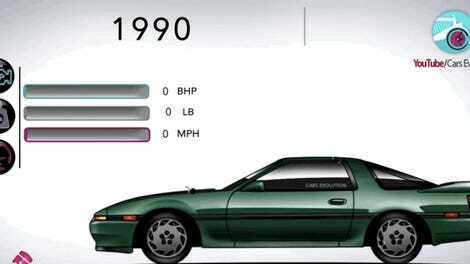 It was the apogee of the eighties and nineties rise of the Japanese car industry. Since then? Nothing. Silence. Tumbleweeds. Until now, of course. The new Supra is finally on its way. And while many details frustratingly remain shrouded in mystery, having driven the prototype around a track I can tell you it was worth the wait—and it feels like a greatest hits album of our favorite performance cars out right now. There have to be hero cars. That’s what Toyota’s car-nut CEO Akio Toyoda decreed a few years ago, all while he kept the Japanese giant well and truly on course when it comes to sales volume and healthy profits. But he also recognized that just focusing on chasing volume is a race to no one caring about your brand. And so he asked Toyota’s performance chief Tetsuya Tada to create the GT86, a retro-style throwback to the old Celica and AE86 rear-drive Corolla. Now Tada has been tasked with creating a Supra for the 21st century. But the road to the new Supra hasn’t been straightforward. We’ve been waiting and waiting and waiting some more. Then the FT-1 concept car. The appearance of the FT-1 in the Gran Turismo video game. Then the Gazoo Racing Sport Concept. Then the reveal of the prototype Supra proper, in its heavy camouflage, at the Goodwood Festival of Speed this year. The new Supra has had more hype and more teasers than Avengers: Infinity War, and even that beat the car out. Production won’t even start until the spring of next year. If you’re waiting for delivery, it’s going to be into the summer of 2019. Order books don’t open until Oct. 2. Even now that we’ve driven it, Toyota is still being taciturn. I don’t know the full technical specifications yet (although it doesn’t take Columbo to work them out) and I still don’t know what it looks like under the dazzle camouflage. Here’s what I do know. It’s a cooperation project with BMW that also yielded the new Z4, but it’s not badge engineered. In fact, the two cars grew farther apart during the development process as Toyota set out to create a more focused sports car, and BMW more of a grand tourer—although the two cars did swing back again to meet more in the middle by the end. I guess, as they certainly feel, there’s no shame in that. I did ask if reliability was a concern—it’s not unfair to wonder if a BMW engine will be as bulletproof as a Toyota engine—but was told that it’s covered by the usual Toyota warranty, so that should be enough (although one official did admit that there were some “long discussions” with the warranty department over it). It’s a very compact two-seat coupe, with tightly-drawn bodywork, a double-bubble roof to liberate helmet-space for anyone of Dan Gurney size, and from what we can see under the tape, styling that sticks very closely indeed to that of the FT-1 concept car. It’s rear-wheel drive, of course, and uses double-wishbone suspension at the front and a multi-link rear end. There’s no transaxle (too much weight, says Tada) but there are optional adaptive dampers, constant-rate steering, and a pretty simple Normal and Sport electronic setup. You drop into the cockpit through shallow doors, but getting in and out isn’t unusually difficult. This is no Lotus Exige. The cabin is snug, but sufficiently roomy in its two-seat layout for two tall passengers. Unlike past Supras, it’s a pure sports car, with no back seat. I’m a hair over six-feet tall and I fit very comfortably, bar the bucket seat being a touch snug around by over-padded back. Much of the interior seems like a straight lift from the BMW Z4, although Toyota claims that the cabin is unique to the Supra. I’m not convinced yet. As our test cars were engineering prototypes, all but the most vital dials and buttons were covered with heavy felt panels—a fun thing to look at when you’re speeding down a track—but peering behind those then the PR minders weren’t looking showed a lot of BMW-style switches, buttons and even the rotary iDrive controller. The steering wheel and shift paddles for the eight-speed auto look and feel very BMW, and even the digital displays speak to you in German. The main visual difference between this cabin and that of the Z4 is that the Toyota’s main instrument pack and central infotainment screen are separate units, rather than being conjoined as in the Bimmer. I’m not sure how I feel about that. Clearly, sharing parts makes good economic sense and if cutting costs on the button front means we get the new Supra rather than not getting it, then that’s a good thing. But I can’t shake the feeling that this is a little like the Mazda MX-5/Fiat 124 Spider thing—too close of a copy inside. In fairness, it’s not fully finished but if they leave it the way it is, it will look too much BMW and not enough Toyota on the inside. We’ll see when the finished interior is revealed in full, as Toyota certainly still has time to change things around a little. Thumbing a silver button behind the steering wheel brings the straight-six to discreet life. We’re starting in Normal mode, so no artificial rev-blare on startup here. Early morning runs in your Supra will not disturb the neighbors. For an engineering prototype, our Supra felt remarkably well-finished. Some of the cabin plastics (well, the ones that we could see) were clearly not signed off yet, but there were no squeaks nor rattles, the engine didn’t fluff nor stumble, and most of all the ride felt beautifully controlled. Toyota says that 90 percent of the Supra’s development work has taken place on public roads, rather than race tracks, and boy does it show in the ride quality. The Supra rides with a calm precision, the dampers and springs taking the edge off sharp impacts, speed humps, the odd pothole, but without a hint of flop or roll. On the roads around Madrid—usually smooth, occasionally pock-marked and rippled—it felt hugely well controlled. Comfortable, but with an underlying hint of solidity. Just as you’d want it to, really. Steering feel is a little more up for debate. There is some, yes. Some feedback. A little bit of communication from the front Michelins, but largely it’s like most electric power steering setups — well weighted, but not bursting with feel. In fact, it feels a touch like the setup you’d get on a Le Mans racer. Enough feel to keep you confident, not so much, nor so much weight, that it’ll leave you feeling tired. In fact, given the light steering, the comfy ride, and the reasonably roomy cabin, the Supra is starting to feel more like a cosseting GT than a hard-edged sports car. Wait, though. It comes to you. You just need to give it time, and to find the right road. Unlike the old A80, which always felt like a big car, this A90 Supra has been benchmarked against the Porsche Cayman and is similarly sized overall. It weighs around 3,284 lbs (distributed 50:50 front:rear—remember, it’s a BMW underneath) and in spite of the height of that inline-six engine, actually has a lower center of gravity than the flat-four engined GT86. So it’s agile, and stupendously so. Click the button on the center console for Sport mode, and the Supra doesn’t seem to change its attitude all that much, but it does come a little more to life. Certainly, the engine does. Where before there was creamy smoothness, now there is a stentorian roar, not entirely unlike an old-school Porsche flat-six when you get it past 5,000 rpm. And there is shove, proper shove. The Supra doesn’t take your breath away in how it accelerates—I’m guessing a 4.5-second 0-60 mph time or thereabouts—but it has deep reserves of power. About 340 HP is my educated guess, and the more you press, the more the Supra piles on the speed. We learned today the U.S.-spec Z4 will get 382 HP and 369 lb-ft of torque. Take that as you will here. Toyota hasn’t made any hardware changes to the engine, just software, so it should be pretty similar. The engineers clam right up when you ask—they just say homologation isn’t finished yet. About two-thirds of the way around our test route, the road turned tight, twisty, and very mountainous. It’s a road used for rallying events, according to my Toyota minder, and I’d well believe it. Here the Supra turns from rapid GT into proper canyon-carver. The steering never bursts with feel, even in Sport mode, but it’s always reliably accurate, always willing to tuck that needle nose into a corner. The muscular performance and stable feel of the 911, mixed with the agility of the Cayman. Plus a soundtrack to which you’ll actually want to listen. Let me be frank: in a pre-production prototype such as this, you probably shouldn’t be out on track trying to match Gilles Villeneuve’s 1981 winning lap times, so I didn’t. What I can say is that the noise of that engine never gets old, even as you repeatedly bash into the rev limiter on the uphill-downhill run from Ascari to Portago corners. The Supra understeers very mildly at the limit of adhesion, but never seems to run out of options, never seems to stop looking after you even if you’re ham-fisted with it; and that for a comfortable GT car it eats up a once-upon-a-time Grand Prix circuit with ease. My only gripe on the dynamic front is that, in Sport mode, rippled road surfaces can induce a touch of skip and hop into the front suspension, as the mass of the engine and the springiness of the dampers start to fight with one another. it’s not an overwhelming feeling, but enough that you might back off a little, or switch back to Normal, where the softer damper settings delay the onset. Will one of those updates be a manual gearbox? Don’t hold your breath. “While we know that a manual gives you more joy when driving,” Tada said, it’s just not that simple. The engine has a high torque output, and getting a manual to deal with that means having a heavier shift quality, which Tada doesn’t want. Engineering the sort of manual that could cope with the torque, but shift like a Miata, would cost lots. Tada says he wants to make the Supra “accessible to the fans, to keep it at an affordable price point,” so extra budget for a manual could skew that equation. How much? My educated guess, again, is around $65,000. I’ve heard $40,000 spoken of as a possible price tag, but that doesn’t seem right to me. The current Z4 range tops out at over $70,000 and the new Z4 M40i is expected to come in above $60,000 so I’m taking a leap that the Supra will be priced close enough, on the basis that neither company is going to want to undercut or be undercut much by the other. The base four-cylinder models will probably be a good bit cheaper, but they’re a ways off yet. A lot of green for a car with a Toyota badge, for sure, but then the Supra was developed, officially, as a “Porsche-killer,” and so you could see it as something of a bargain. So then, the new Supra is a car that handles like a Cayman, goes like a V8 Mustang, sounds not unlike a 911, and should—should—have the quality of a Camry given that Toyota’s been working on it so long. 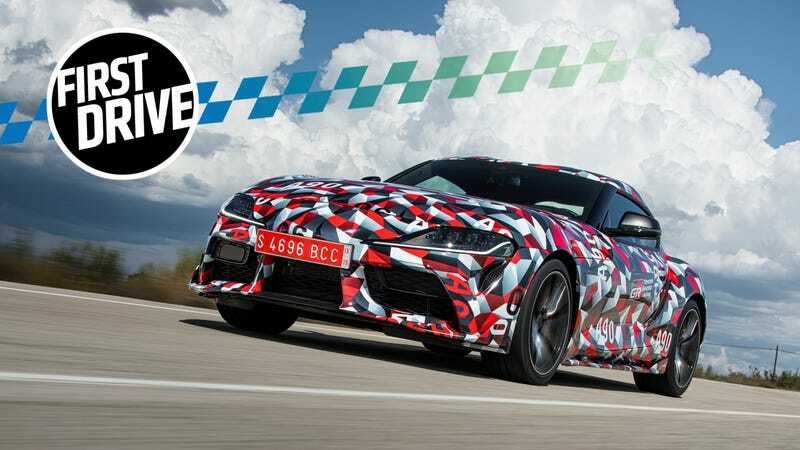 We still need to see the final, finished, car to be certain, and see the full technical specification, but at long last the new Supra is looking like it was worth the wait. Neil Briscoe is an Irish-based motoring writer who loves rotaries, old Land Rovers (the older, the better) and who once managed to win an autocross in a Mini even though he managed to get a cone wedged under the car.